huge live butterfly crawling up your throttle arm because your coat didn't fit snugly around your wrists. Yes. This happened. 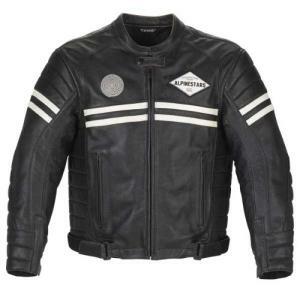 The Alpinestars Dragster Leather Motorycle Jacket comes in a classic black-on-white design. Alpinestars likes to take retro styling and improve it with lots of modern functionality, and they have done that here. This coat is made of 1.2-1.4mm full-grain leather with an "aged top finish" for abrasion resistance. The main seams are multiple-stitched for a strong structure. It has removable inserts (body armor) in the elbow and shoulder. The sleeves are pre-curved, and while this does provide for maximum comfort while riding, be sure to get the right size for you or you'll be pre-curved all wrong. The coat also has an adjustable waist and you can zip it to Alpinestars leather or fabric pants. There is a chest armor piece (Bionic Chest Guard, kids) that you can purchase separately. This coat will run you around $430 to $450, so plan accordingly. You'll also appreciate the Icon Daytona Racing Jacket.